Discovering that my son had multiple food allergies and changing our family's diet eight years ago was the beginning of a journey with many unexpected joys in addition to the obvious challenges. One of the greatest gifts of this journey has been the humongous-hearted people who have entered our lives! One of these amazing people is Tess Masters, aka The Blender Girl. Her website, healthyblenderrecipes.com is a wealth of information, giggles and most-importantly delicious recipes. 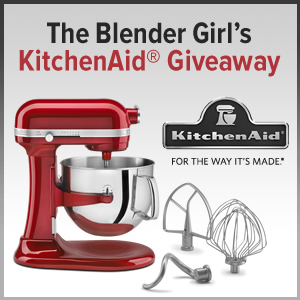 Tess is giving away a 7-quart KitchenAid Stand Mixer to one lucky reader this month. To make the giveaway even more fun (and what could be more fun than winning a kitchen superstar worth over $500? ), she is featuring a different gluten-free blogger every day this month. Today the featured blog is Welcoming Kitchen! Please stop by and enter the giveaway. (I won the last one, a VitaMix, so I can tell you dreams really can come true!) When you're there, please take time to see all of the tongue-tingling baked goods that bloggers came up with this month. I assure you, you won't want to leave your kitchen for a long time! Also, it's Monday, so I want to give some ideas of what we will probably eat today in case you're looking for some Meatless Monday inspiration! Lunch--Sandwiches and fruit for my guys (hummus for one and sunflower seed butter and jelly for the other two men in my life) and fruit. I'll probably have a baked sweet potato topped with a little sunflower seed butter. Dinner--Thai-Inspired Rice Noodles from the Welcoming Kitchen cookbook with a salad. Dessert--Sugar-Free Sugar Cookies from Ricki Heller's Sweet Freedom cookbook. What are you making that's meat-free? Please "like" us on Facebook (Welcoming Kitchen) and follow us on Twitter (@welcomekitchen) to keep the conversation going! I got the idea for topping my sweet potato from you! It is delicious, and makes a really filling lunch. Your cookies are great. I'm really excited to review Sweet Freedom on The Balanced Platter next month!